Poor King Hock-a-lock-a-ding-dong had knee surgery today (wasn't the leg he hurt when he fell through the attic, it was his other leg from a previous injury). Thank g-d the surgery went well, and he is recovering nicely. 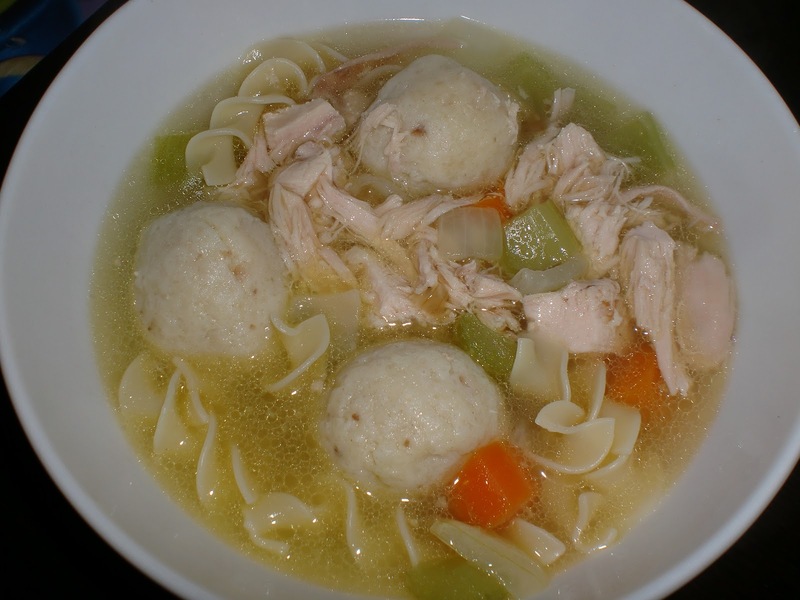 What better dish to make for my patient than chicken soup with matzah balls and noodles? It has magical healing powers. My mom used to have garage sales, but she didn't like to do the work. There used to be a lady in our area who would do the garage sale for you, and charge you a percentage of the profits. She was talented. The first time she came to our house to do a garage sale I was so intrigued by her. I spent the day watching her every move, and talking to her (I'm sure I annoyed her severely). For some reason, I became preoccupied with trying to figure out if she was Jewish. I thought and thought of ways to find the answer and then I came up with an idea. I went inside, grabbed a piece of white bread and rolled it into a tight ball (I may of or may not of chewed it first). I took the ball outside and said to the garage sale lady, "do you know what this is?" She replied, "that's a matzah ball!" Then I said, "I knew you were Jewish!" It's hard for me to make matzah balls without remembering the garage sale lady. Tonight we also had a green salad with Russian dressing. All of the recipes are below. The secret to this soup, is first making the broth, and then making soup and using that broth. It's so flavorful and delish. Also, the carrots and celery aren't mushy. Place the chicken inside a soup pot. Add the celery, onions, carrots, bay leaf, and pepper corns. Fill with water until the pot is almost full, maybe 1 or 2 inches under the top of the pot. Put the pot on the stove and bring to a boil over high heat, immediately lower heat to a simmer. Simmer for 3-4 hours. Drain broth into a large bowl with a strainer. Remove the chicken and when cool enough to handle, remove the meat from the bones and shred. Add the shredded chicken to the broth. Discard the bones, carrots, celery, peppercorns, bay leaf, and onions. Set aside the broth with the chicken. In the same soup pot, heat the oil over medium. Add the celery, carrots, and onion. Saute for 10 minutes. Add the garlic powder, broth and chicken. Stir everything together. Start with 1/2 t. salt and decide whether it up to 1/2 t. needs more. Bring to a boil, and then lower heat to a simmer for 30 minutes. Serve with matzah balls and egg noodles. This recipe make 12 small matzah balls. In a small bowl lightly beat the eggs. Add the vegetable oil, matzah meal, and salt. Stir to combine. Place in the refrigerator for 20 minutes. Bring a large pot of water to a boil. Add 1 t. salt. 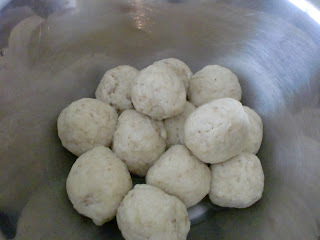 Form tablespoon or smaller sized balls, should make about 12. Drop the balls into the boiling water. 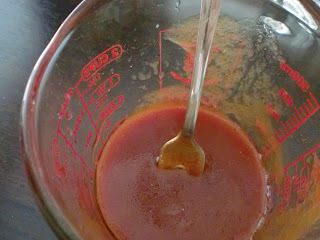 Cover tightly with a lid, and reduce to a simmer. Cook for 20 minutes. Use a slotted spoon to remove from the water. I love this dressing with chopped iceberg lettuce and avocado. Whisk together the above ingredients. Can be stored in the refrigerator for 1 week in a jar with a lid. I need to go tend to my patient. I hope you have a good night.